The Socceroos need look no further than the result of two meetings with France back in 2001. Anything, including miracles are possible. Certainly, this Australian side is no as strong as the 2001 version, but France were much stronger (reigning World Cup Champions) in 2001 too. Coach Bert van Marwijk will have his side ready to defend like demons and attack France on the counter. Can Tim Cahill score for the fourth World Cup in a row? Les Blues are a young team on the rise and yet to peak. With endless amounts of first-rate-players to choose from, coach Didier Deschamps faces a headache just finding his best 11. In the last two World Cups played in Europe; 1. A France win 2. A Final place. Is Paul Pogba the real deal who can win France the World Cup, or a fancy prima donna? If you want to bet for a win, clearly have it on France. For those looking to display pride in the Aussie colours or just looking for betting value, look for the Socceroos to throw everyone behind the ball, defend grimly and hold the French scoreless or at least under 1.5 goals at $3.40. If he plays, at 38, Tim Cahill will become the oldest player to ever represent Australia in a World Cup match. Cahill is the Socceroos all-time leading scorer with 50 goals from 105 appearances. France lost 3-2 to Colombia in a warm-up game, Australia drew 0-0 with the same Colombian side 4 days later! 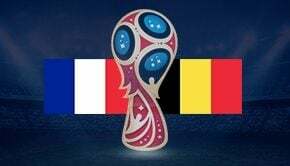 France: Hugo Lloris (captain), Benjamin Pavard, Presnel Kimpembe, Raphaël Varane, Samuel Umtiti, Paul Pogba, Antoine Griezmann, Thomas Lemar, Olivier Giroud, Kylian Mbappé, Ousmane Dembélé, Corentin Tolisso, N’Golo Kanté, Blaise Matuidi, Steven Nzonzi, Steve Mandanda, Adil Rami, Nabil Fekir, Djibril Sidibé, Florian Thauvin, Lucas Hernández, Benjamin Mendy, Alphonse Areola.